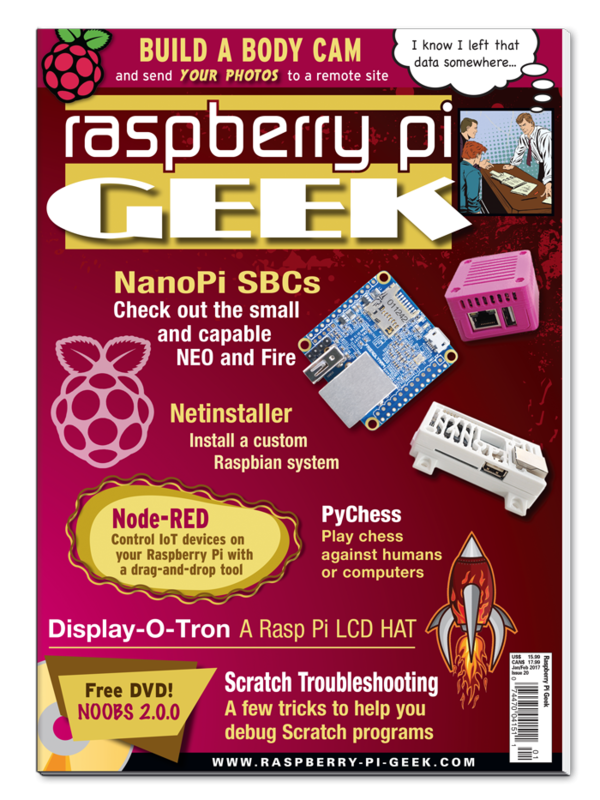 In this issue, learn how to put your Rasp Pi data on a web page, navigate the high seas with free navigation software, and play a challenging game of chess. Free navigation software makes the Raspberry Pi a control center for boat electronics. Meet the small and inexpensive NanoPi NEO and NanoPi 2 Fire by FriendlyARM. A sensor on a Raspberry Pi GPIO pin plus Node.js lets you see your data on a web page. Data from a network of weather stations collected, processed, and served with Rasp Pis. MQTT messaging controls multiple Pi music players from a smartphone. This inexpensive HAT has a threeline LC display, making it perfect for projects that don’t need a bulky monitor. Set up a pre-defined, customized version of Raspbian. Make your own body cam with a Raspberry Pi, a webcam, a WiFi module, and some Python. Send documents to a printer and automate many tasks from the command line. A light sensor on a Raspberry Pi measures various components of the light spectrum. Pgrep is a valuable tool for tracking down processes. Programming hardware with a drag-and-drop tool.